Do you still remember the process on how Globe Share a Load works? 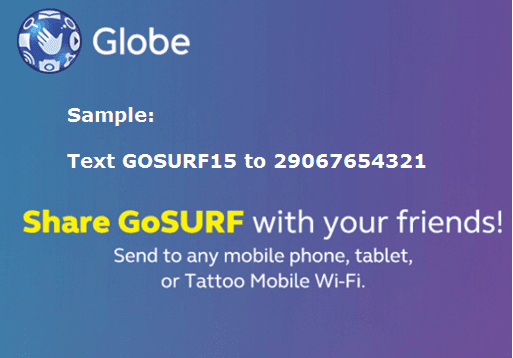 Here's more about sharing Globe promo to other friends mobile number. 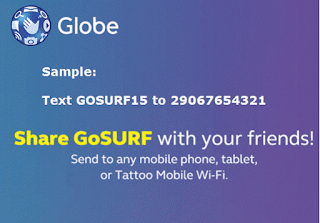 This time you can now share GoSurf internet promos to any same network prepaid subscribers. By simply following the simple steps on *143# menu or by keying in the keyword provided below, you can instantly share it to your friends and love ones. Do note that the recipient will not receive the GoSurf promo you sent until you reply YES on the confirmation message sent to you by Globe. Just text GOSURFPROMOCODE then send to number 2+10 digit promo recipient mobile number. You will be charged P1 on every share you made. Just make sure you have enough balance prior to sending a promo to other number. Check out How to do Balance Inquiry in Globe. You can share this promo to mobile phone, Tattoo pocket Wi-Fi broadband number and even tablet. Hurry and load now at your nearest Globe load retailer or kiosk to start sharing a promo. For inquiry you call Globe hotline or visit their social media account to ask for support and assistance.